There have recent reports in the literature of increased rates of bladder recurrence (BR) after radical nephroureterectomy (RNU) when diagnostic flexible ureteroscopy (DFU) was performed before RNU. The technical heterogeneity of DFU was a major bias in these studies. Our purpose was to evaluate the impact of a standardized DFU technique before RNU on the risk of BR. A retrospective monocenter study including patients who underwent RNU for upper tract urothelial carcinoma (UTUC) between 2005 and 2017. 171 patients were identified. 78 patients were excluded owing to a history of bladder cancer before RNU or neo-adjuvant/adjuvant chemotherapy. 93 included patients were stratified according to pre-RNU ureteroscopy (DFU + 70 patients) or no pre-RNU ureteroscopy (DFU—23 patients). 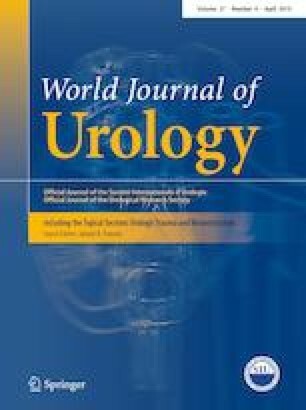 The standardized DFU technique consisted of systematic ureteral sheath (ch9–10), flexible ureteroscopy, biopsy, and drainage with a mono-J/bladder catheter to avoid contact of contaminated urine of the upper tract with the bladder. Epidemiological, initial staging, and postoperative tumoral characteristics were similar in both groups. Mean follow-up was 35 months [2–166], 47(50%) BR occurred with 41(87%) in the DFU + group, and pre-RNU–DFU was an independent predictive factor of BR (OR = 4[1.4–11.9], P = 0.01) (Cox regression model). The characteristics of BR were similar in both groups, although BR occurred earlier in DFU + (427 days vs. 226 days (P = 0.07)). Bladder recurrence after diagnostic ureteroscopy + nephroureterectomy was high despite technical precautions to avoid contact of bladder mucosa with contaminated urine from the upper urinary tract. Post-DFU endovesical instillation should be investigated. Study concept and design: RB, MB, and EL. Acquisition of data: MB. Analysis and interpretation of data: RB, MB, and EL. Drafting of the manuscript: RB, MB, and EL. Critical revision of the manuscript for important intellectual content: EL. Statistical analysis: MB. None. Administrative, technical, or material support: Baboudjian, Boissier, Lechevallier, Michel, Lannes, Akiki, Gaillet, Delaporte, Ragni, Toledano, Karsenty, Rossi, and Bastide. Supervision: Boissier and Lechevallier. None of the contributing authors has a conflict of interest, including specific financial interests and relationships and affiliations relevant to the subject matter or materials discussed in the manuscript. The study was declared and approved by the ethics committee of the Assistance Publique des Hopitaux de Marseille (APHM): study reference 2018–2019. The study was also declared and approved by the Ethics Committee of the Association Française d’Urologie (AFU). The study has guaranteed compliance at all times with the Law of Jardé on the Research including Human Persons (November 18, 2016, French Government).